Adam Irvin hails from Springfield, Missouri. Adam had completed over 70 marathons in all 50 states, D.C. and on all 7 continents. Adam is a three time Marathon Adventures Alum, having joined us for the 2015 White Continent Marathon, 2015 Sydney Marathon and 2016 Victoria Falls Marathon. 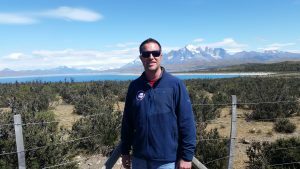 Adam has also served as Adventure Director for the 2016-2018 White Continent Marathon, where he was the Race Director in charge of managing the time and organization of both the WCM and Punta Arenas Marathons. Prior to his marathoning, Adam served in the U.S. Marines. After being honorably discharged from the Marines, Adam has worked for the past 16 years for one of the world’s largest mobile telecommunications providers, serving as their Sr. Program Manager.